We flew into La Paz from Galapagos Islands on an Avianca Flight which landed at 2:30am. We didn’t have a hostel booked so we thought it was best to wait till dawn and then head out looking for a place to stay. Anyway, Shruti’s visa process took about 40 minutes although we had all the paperwork in order. We thought the visa was USD 55 but turned out to be lot more. And, the immigration officer only excepted Bolivianos, though luckily there was a currency exchange outlet just at the airport. We slept for a couple of hours at the airport. Somehow we got mixed up with time and left the airport thinking it was 6:30am, but in reality it was 7:30! Guess we didn’t hear the air stewdardess announce about the time difference when we landed. PS: The on-arrival visa fee for Indians in Bolivia is now USD 95. We highly recommend getting your paperwork sorted and getting a visa stamped free of cost at a Bolivian Consulate from where you are flying. It was incredibly cold outside the airport. The La Paz airport is situated in El Alto, which is 4000 meters high making it one of the highest airports in the world! We could also see a magnificent snow covered mountain in distance, it definitely was a beautiful first sight of the country! The minibus to the city costed only 4 Bolivianos per person, USD 60 cents. Generally speaking, the entire country of Bolivia is at an high altitude. Apart from the Amazon Jungle, I would guess the lowest altitude along the mountain range would be 2300 meters, in Cochabamba. La Paz is situated in a canyon at 3689 metres. After arriving from the airport, we had to walk uphill with all the bags. The altitude was really hitting us – we were breathing very heavily, the palms were cold though our bodies were perspiring by the time we got to the hostel. The rest of the time, we had a problem with what to wear. La Paz was incredibly hot, when under direct sun, and cold, if you happen to be in shade, at the same time! For the altitude, we bought coca leaves and lejía and kept it in our mouths everyday. It definitely seemed to help with the breathing. San Fransisco Church and Plaza is one of the main gathering areas of the city. The church is so big that it takes up entire block on the main road of La Paz. 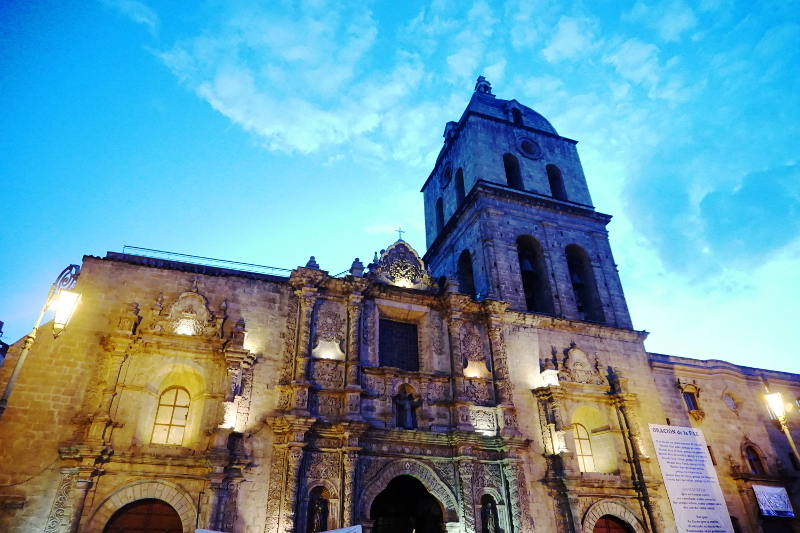 The church was built in the Baroque-Mestizo architecture. It is the finest building of this architecture and is made entirely of stone. As with any Latin American plaza, it was full of people sitting, eating and protesting about one thing or another. 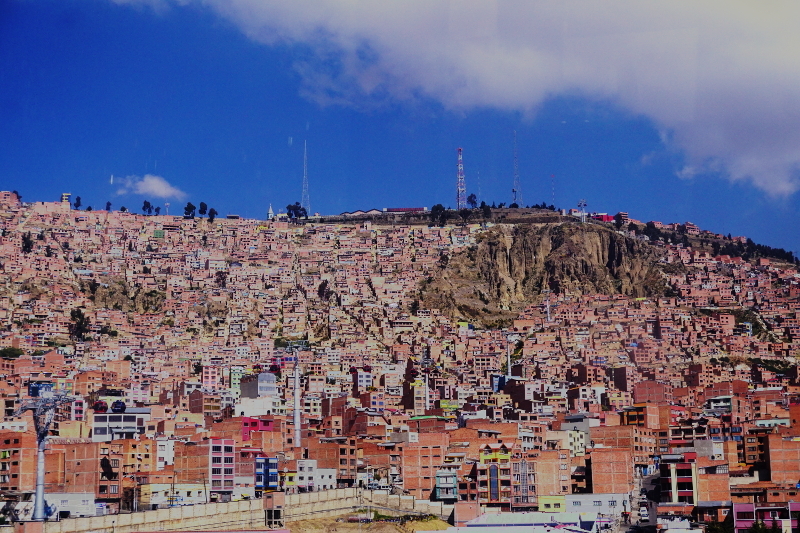 La Paz is a city surrounded by mountains and many high areas which provide great viewpoints (miradors) of the city. 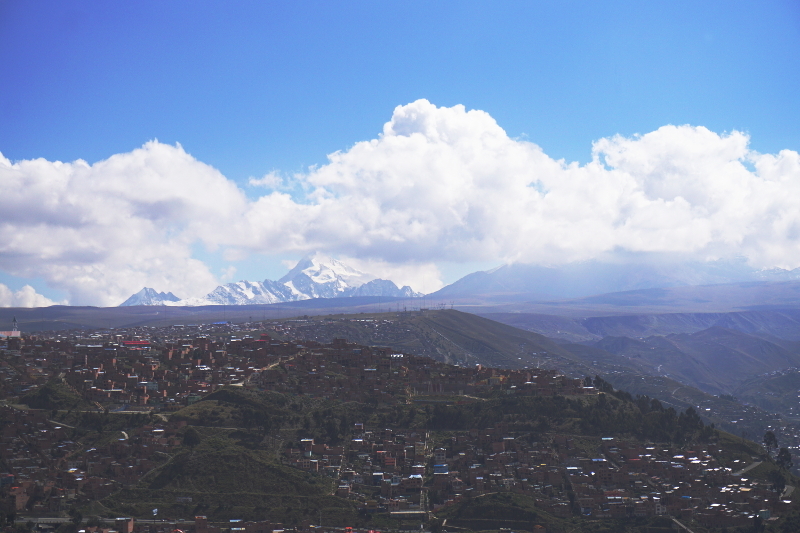 We decided to visit El Alto to view the mountains for ourselves. Thankfully, we didn’t have to walk up the hill as there is a cable car uphill from Central La Paz. The ticket was only 6 Bolivianos each way per person, almost USD 1, and at 10am it was mostly empty. The view was incredible as we started ascending. 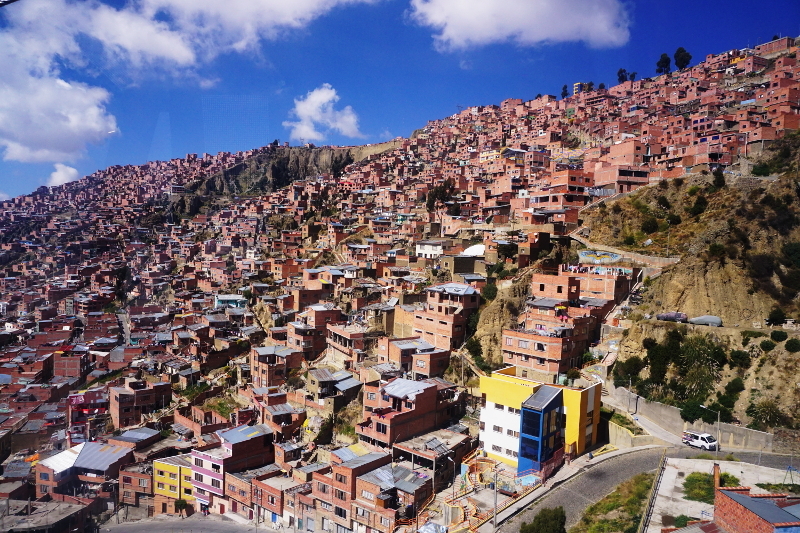 La Paz doesn’t have slums like Medellin. The houses up the hill looked decent and less rustic in context. In Bolivia, people generally don’t paint houses and therefore have a ‘brick veneer’ look. The view of the mountains though was incredible. 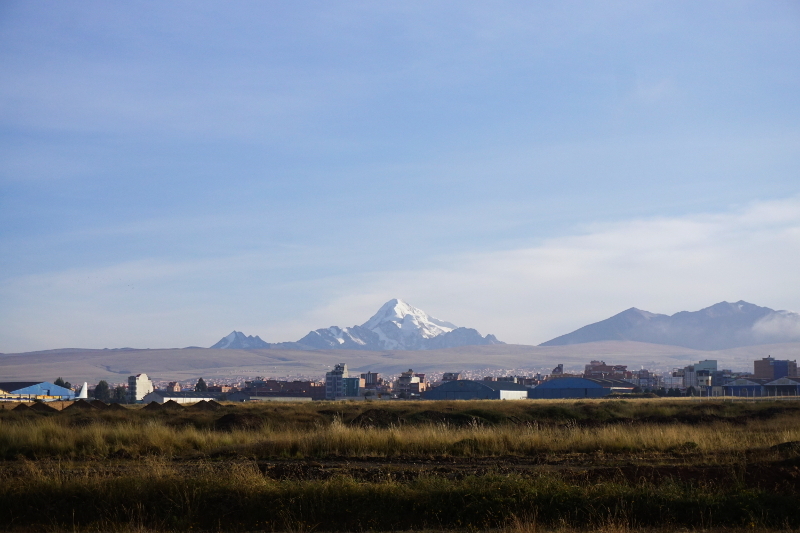 We could see Huayna Potosi, Chacalataya and Illamani mountains from the last station at El Alto. While it was stunning, it was also a couple of degrees cooler though it was bearable. For 12 Bolivianos (under $2), not bad at all! 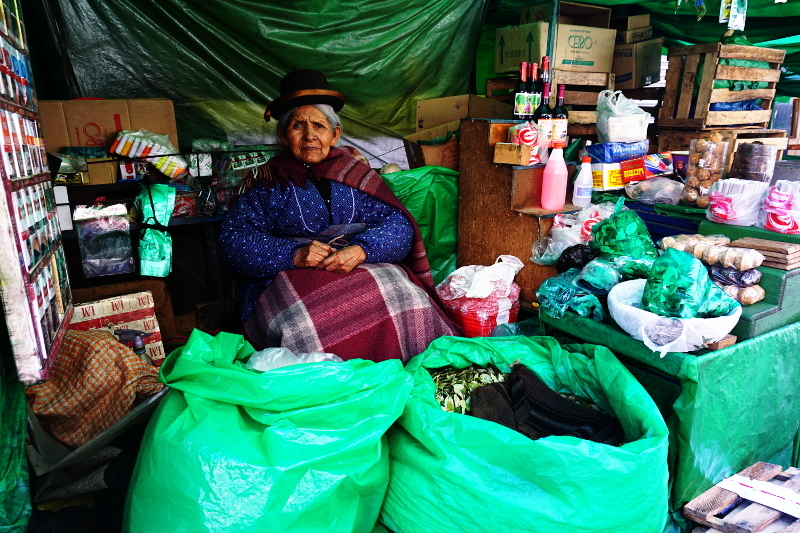 When we initially heard that La Paz had a market of the witches, we were shocked, excited and curious, all at the same time. We ended up visiting the market a few times. There were 2 streets with around 15-20 shops. Each of them had dead baby llama carcases outside. Additionally, lots of shops had little charm idols representing good luck, abundance, health, love, safety and also had traditional medicines. There were also drinks for offering to Pachamama, the Goddess of Land. 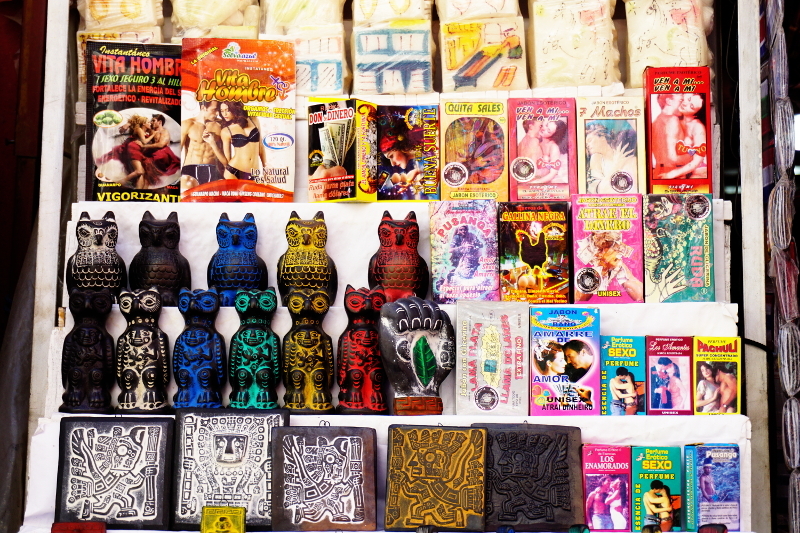 By visiting museums in La Paz and Cochabamba, we learnt more about the rituals and charms in Witches Market. 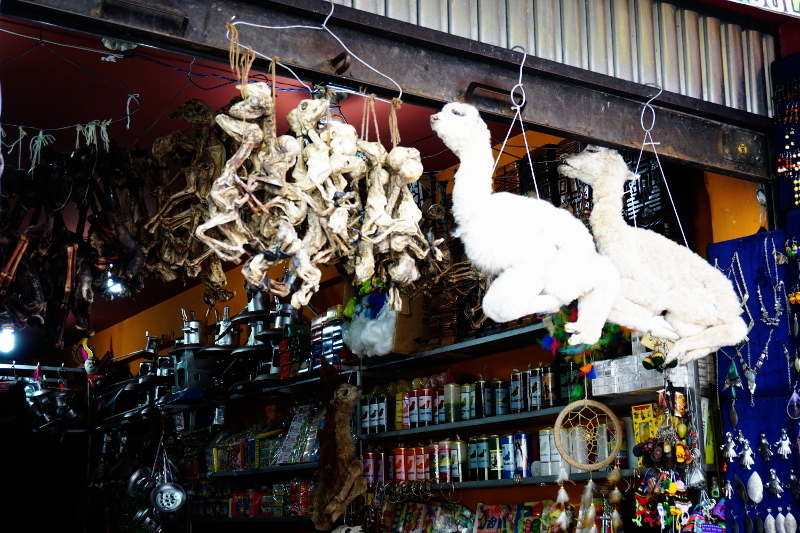 The people in the countryside slaughter pair of llama for Pachamama but people in the city cannot do the same. Therefore, every Friday or before starting a new task, such as, building house or business, they burn offerings for Pachamama. The shops in Witches Market provide the raw materials for these rituals. The Ethnographic Museum was in the main government area of La Paz. 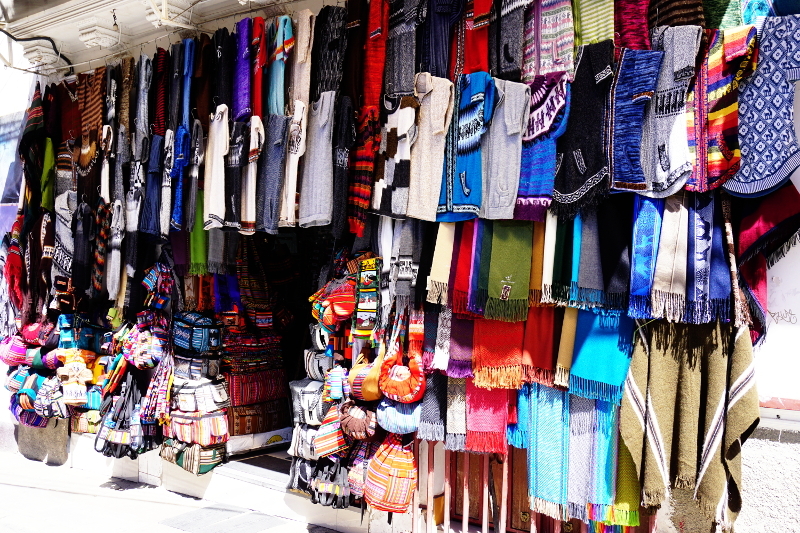 We bought tickets and started walking around seeing the textiles of different groups in Bolivia. As we finished with that section, we go to a room full of masks of Bolivia. Just then, a man approached us about a guided tour. He worked for the museum and the tour was in English and free – of course we said yes. The guide explained us the meaning of different masks. He told us about the fiestas or dance festivals in Bolivia. 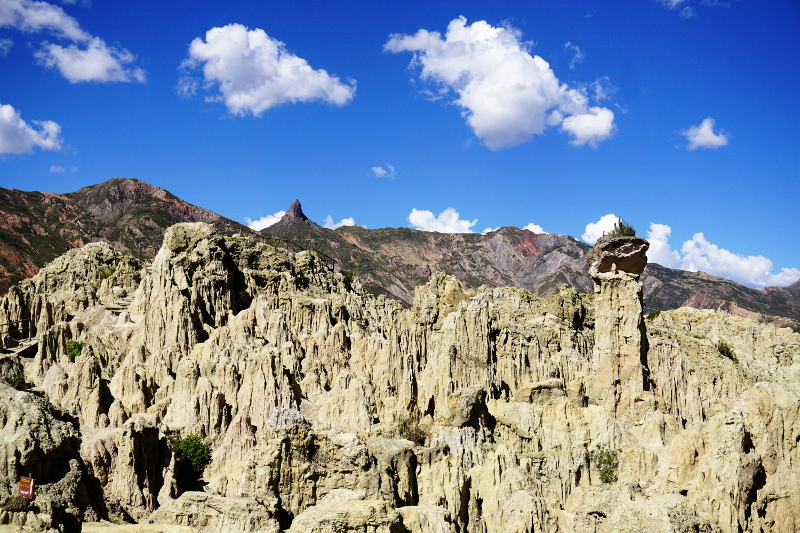 This was one of our first days in Bolivia and we were keen to find out the native culture. The masks represented the Spanish conquererors, slaves, Chinese who were brought to the colonies and the Native Gods. A particular fiesta caught our attention. In some villages, the locals participate in a fiesta to please the Gods and call upon good luck for everyone. But in order to do so, someone from the village needs to volunteer to be the ‘sucide guy’. The constume he wears, especially the mask, for 3 days of fiesta is very heavy. Additionally, everyone drinks with him during the fiesta. Eventually, towards the end of fiesta, he dies either due to alcohol poisoning or by breaking his neck. The people rejoice at his death as it marks a successful fiesta. As we went further, the guide explained about the Tiwanaku and Inca cultures. While Incas are more famous, Tiwanaku had a larger and longer influence on Bolivia. A large part still speaks the Tiwanaku language, Aymara. Next, we learnt about the Spanish conquest and is sad effects of Bolivia. The slavery of people in the Potosi mines, farming for coca and racially subjugation. Moreover, Bolivia lost its coastline to Chile in a war that was funded by British. 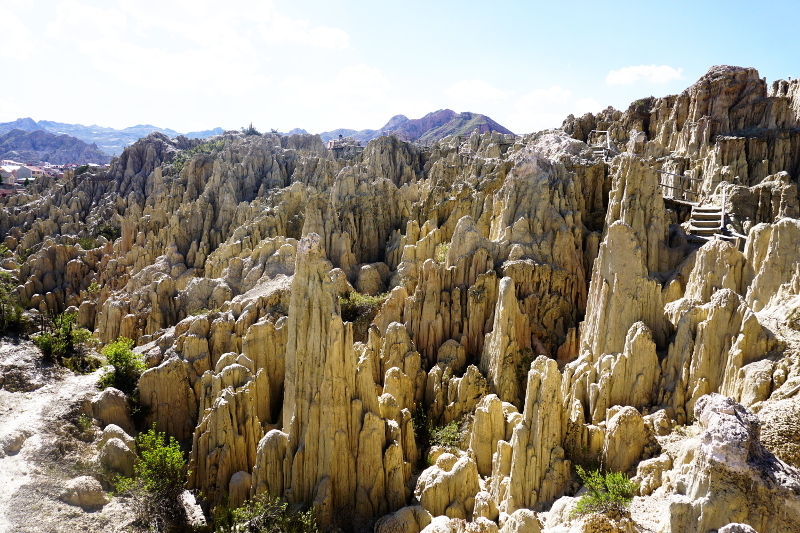 Our guide felt that Bolivia had been mistreated by foreigners. The guide told us that conditions in Bolivia turned 10 years ago when Evo Morales, an indigenous person, became the President. He had brought changes to the country which benefited the indegenous people for the first time since the Spanish conquest. Definitely something to smile to at the end of our tour. The museum had a few other amazing rooms like the native beanies and weapons. There were hundreds of beanies of different tribes. It was a spectacular exhibition. Same with the weapons too. A great visit! One of the places I really wanted to visit in La Paz was the Coca museum. As someone who has grown up in the west, Cocaine is a big problem. It makes young people waste vast amounts of money, kills many with addiction and the government spends millions trying to stamp it out. On the other hand, countries like Bolivia and Peru has millions of people using Coca leaves on a daily basis. How can that be? The coca museum was at the back of an old building. It was a little rustic and involved a lot of reading but it was truly informational. As we entered and paid our entry fee, the owner gave us some coca leaves, stevia and a information book and told us to follow the numbers. 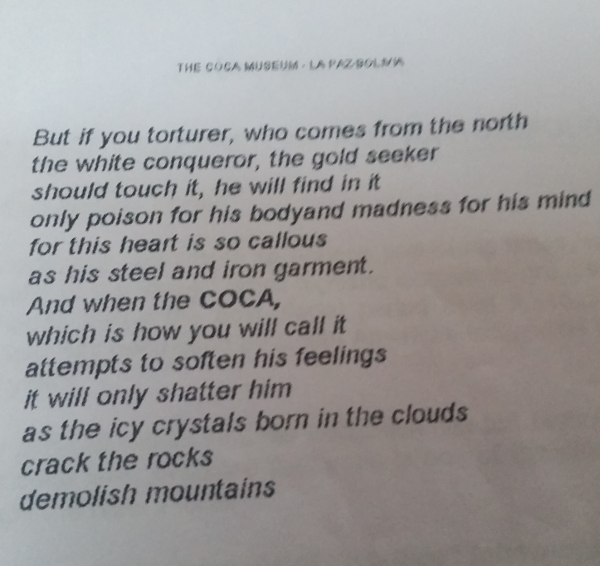 The first page had a legend or a poem from the Native Gods about how the white man would loot native lands and use coca leaves to kill people in the mines and eventually will from the coca. Great start! The museum showed the history of coca in Latin America, its uses in rituals and traditions. Next, it showed how coca is grown and how it was used in a negative way by the Spanish Conquorers. The miners were provided with plenty of coca leaves, which allowed them to work for days without feeling thirsty, hungry or tired! We also learnt about the various components in the leaf and why people use it. In the Bolivian antiplano, coca leaves are a necessity for the altitude. There is a small amount of cocaine but you would have to chew 4 bags worth to have the affect of 1 gram of cocaine. The next part involved how cocaine was invented in the West by scientists, used by famous people including Sigmund Freud. Fun fct that we didn’t know was Coca Cola was initially made with cocaine and after the ban, continues to use coca leaves for flavour. The chemicals used in the process of making cocaine were not found in Bolivia but still countries like Peru and Bolivia are blamed for the western problem. As a result, Bolivia had to kill its own people to please USA. An amazing story especially knowing that Bolivia doesn’t have a cocaine problem but an alcohol problem. People chew coca here like we chew chewing gum. It certainly changed our perpective of Coca. A good place to visit in La Paz! 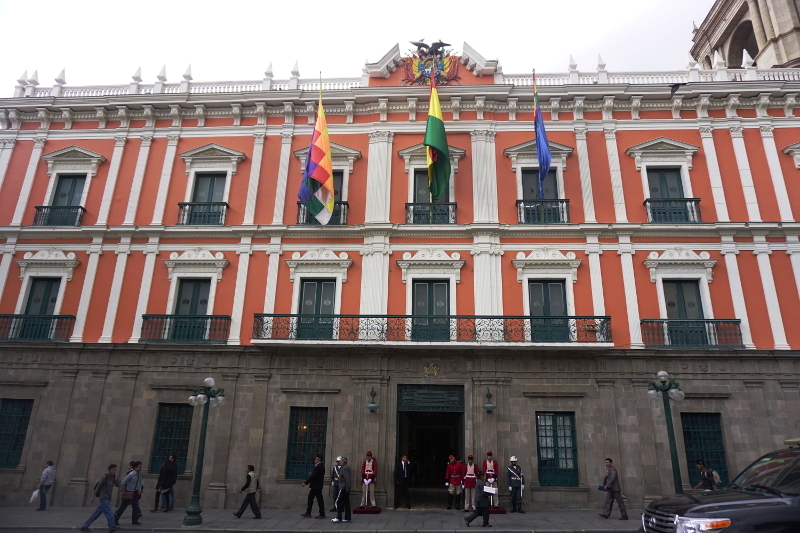 While staying at Wild Rover Hostel, we stumbled upon the Presidential Palace and other government buildings in La Paz. 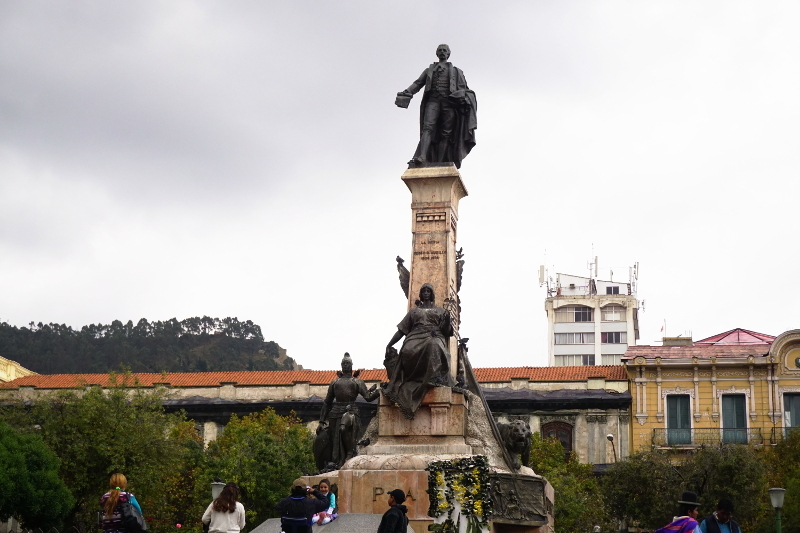 The plaza is really a square park and there are colonial buildings on all sides. The Presidential Palace has the Presidential Guards as well as the Military outside. There were a lot of people sitting in the park and the area seemed a nice place to chill. A tall pillar stood in the middle of the park as a memorial. The Cathedral of La Paz was next to the palace. The building was made entirely of stone similar to most churches in Bolivia. 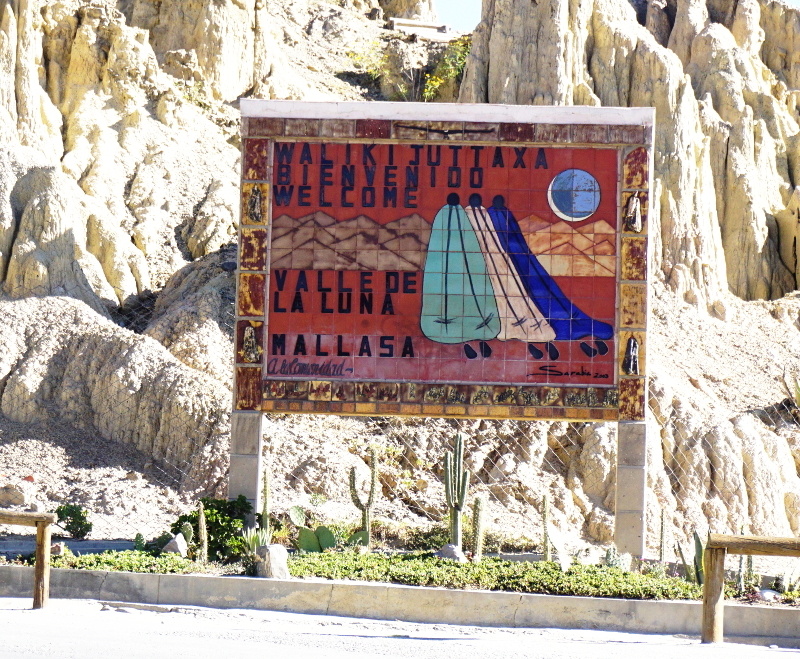 Valley of the Moon is a unique landscape within the city of La Paz. Due to the geological changes within the area, clay deposited in the south of the city but later became a canyon of clay. However, that wasn’t the end and eventually the clay canyon started weathering away making mounds of clay over a huge area. We could have visited the valley through an organised tour but then we wouldn’t be backpackers. We caught a local taxi to Mallasa area for 2 Bolivianos each, less than USD 30 cents. As we neared the town, we told the driver to drop us at Valley of the Moon. The entry was 15 Bolivianos per person, just over USD 2, we were in the precinct. Our first thoughts were “wow” and “what the hell happened”. The terrain really liked like it could be the moon. It was brown, lifeless and towers of clay everywhere. We chose to do the 40 minutes walk around the precinct. Some of the clay towers were named such as Lady’s hat and Mother of the Moon Tower. The landscape around was truly something we had never seen before. We eventually took the trufi (pool taxi) back for 5.20 Bolivianos and returned to centre of La Paz. All for under 40 Bolivianos which converts to $6USD. Gotta love Bolivia! On our second trip to La Paz, we stayed in the touristy area called Calle Illampu. 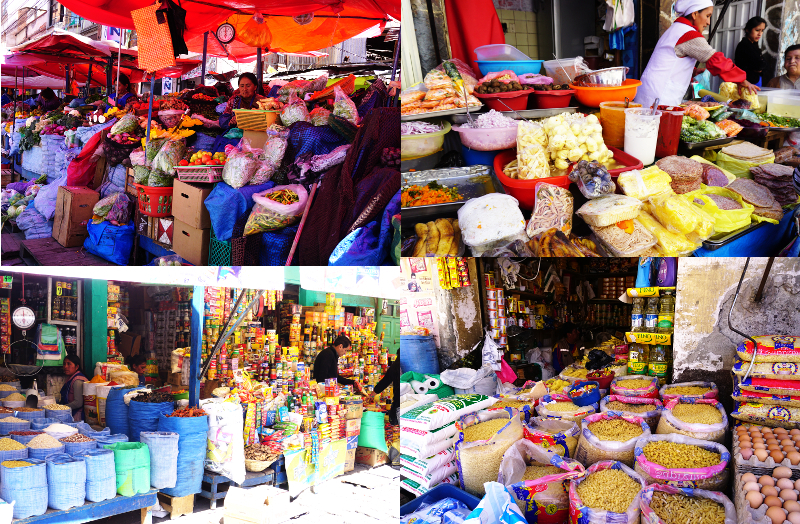 This part of La Paz has a lot of markets of different things. One day as we were returning from Peru Consulate when we realized that there was a huge food market near us. There were old ladies selling vegetables and fruits on the streets, small shops selling groceries, boiled vegetables, sauces, meat, cheese, bread and even spices. As we are always looking to save money, this market turned out to be perfect for us! 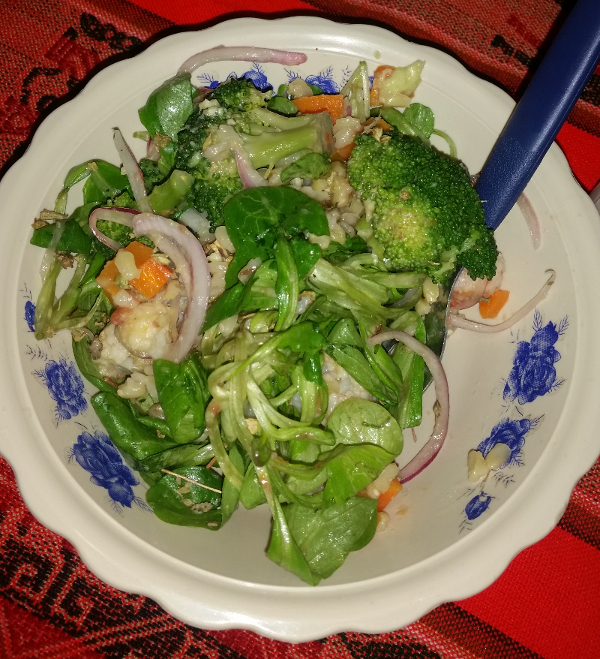 We ended up cooking for next few days – eating cheap and healthy. Additionally, this market also made Shruti and I nostalgic of a time in India when buying groceries meant going to lots of shops and street vendors with mum. It was a great feeling to not buy from a big supermarket for a while. While we’ve avoided buying a lot of things so far, Bolivia was an exception. For one, it is comparitively cheap and was our second last country in South America. This made it a perfect destination to buy some things for home. We bought gifts small and big for friends and family while helping out small businesses or small vendors.